Now, isn’t it so much easier to focus the New Year on the one thing that will make the biggest difference in your life? 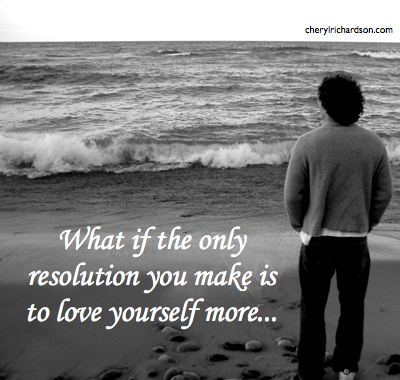 What one thing would you do differently today if you loved yourself more? My mom sent me this sweet video – it’ll warm your . You can watch it here. Thanks, Mom! Life Makeover For The Year 2013 (sm) is written and produced by Cheryl Richardson. If you have any questions or comments, or for reprint permission of this newsletter, please email:cheryl@cherylrichardson.com. © Copyright 1999-2013. Cheryl Richardson, P.O. Box 13, Newburyport, MA 01950.